Predict your next drink with this deck of 30 Tarot-inspired illustrated cocktail recipe cards. Cocktails can be a little bit magical: They can make you feel like you're in the right place at the right time. Possibilities look brighter. You're more in touch with... something. Katie Seibel's Tarot of Cocktails deck adds a touch of mysticism to the misty world of cocktail magic. Working in the kitchen of her studio apartment, she created 30 original illustrations, taking the basic composition of a classic tarot card and cleverly replacing key elements with references to the craft cocktail recipe on the back. Wands became cinnamon sticks; pentacles are slices of citrus; a tarot heart is now a cocktail strawberry. The recipes, too, combine originals and riffs on classics, including a wide variety of drink types, flavors, and levels of complexity, all developed with the casual connoisseur in mind. The included companion booklet contains tips, tricks, and special ingredient instructions, with room for notes. A hippie kid from Kansas turned Portland-dweller, Katy Seibel is a multi-faceted creative eager to experience a little bit of everything. While her education and career have been primarily focused on writing, she has always maintained a slew of hobbies and side gigs, including artistic endeavours and craft cocktail creation. An enthusiastic, self-taught home bartender with an intuitive palate, Katy set out to create a cocktail collection that wasn’t just another recipe book. Inspired by her lifelong appreciation of the beauty of classic tarot cards, she decided to combine her interests in cocktails and illustration to create a tarot-themed drink recipe deck. As soon as she dove into the project, it seemed that Tarot of Cocktails was written in the stars. Katy shines most when synthesizing various components – visual, verbal and conceptual. Tarot of Cocktails merges several of her passions, which is evident in the product she’s lovingly created. When she’s not working, Katy is usually hiding out at the nearest movie theater, combing a thrift store for vintage gems or tugging on the leash of her adorably stubborn pug, Igby. Includes 30 cards and booklet. These cards are so pretty and perfectly on theme. 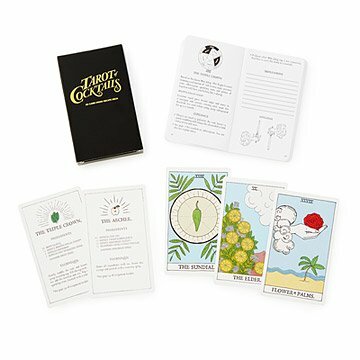 They combine tarot cards and cocktail recipe into a perfect and unique gift. Cocktail recipes include some classics and some originals so there is something for every taste.